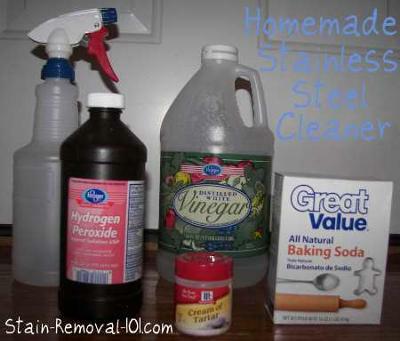 You can make your own homemade stainless steel cleaner for your stainless steel appliances, sinks, and also pots and pans. These recipes below also use natural ingredients, which is great for surfaces in your kitchen, especially those like your pots and pans that you will then eat out of. Combine the ingredients together to make a paste, and then rub it on the stainless steel with a clean cloth and let it dry. Once it is dry you can wipe off the dried paste with water and then buff dry with another clean cloth. Hint: This is also an excellent way to clean stainless steel pots and pans. ***Update: I tried this and it worked for me. However, Mary M. wrote in to say the following: "I tried this, and it made a big mess, and looked worse after the buff. I was afraid I messed up the finish forever. NOT a good mix for stainless steel! Just use the vinegar….? Worth a few buck to buy the stainless steel cleaner at the store!" Your stainless steel sink, pots and pans, and also your appliances if they get splashed with water, may develop hard water spots. The simplest way to remove these spots is to dampen a clean cloth with white vinegar and rub it over the spots. The acidity in the vinegar will break down and remove the alkaline hard water spots, leaving your stainless steel clean, bright and spot free. Combine these ingredients in a spray bottle and shake to combine. Wipe onto the surface, and then off again, with a clean cloth. Do you have your own homemade cleaning recipes? If so, you can share your homemade cleaners recipes here, or read others already submitted. I've also received some polish recipes which I've added below, so scroll on down for more! Join in and write your own page! It's easy to do. How? Simply click here to return to how to clean stainless steel. 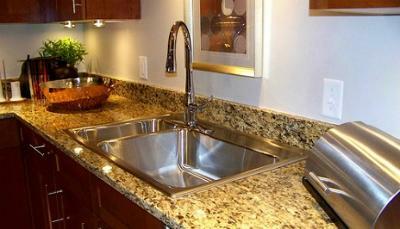 Kendra shared a tip for how to shine a stainless steel sink or other stainless steel appliances, after you've cleaned it. I used to have my own cleaning business, and when it came to stainless steal sinks and appliances I would always like to leave everything not just clean but I wanted it to shine for my customers, so when they walked in it was noticable that I had been there. After cleaning a stainless sink with an all purpose cleaner I would take mineral oil on a paper towell and wipe the sink thoroughly down with it, making sure to rub it in good and not leave any excess oil behind. My clients loved it and always commented on how nice it looked. This works on all stainless appliances too. Mineral oil is also an excellent substitute for furniture polish as well, and very inexpensive. Thanks so much for the tip Kendra. I know people like to not only clean up, but also polish their stainless steel appliances and other items. Since your sink is an area which may touch food items, I would suggest using a food grade mineral oil (such as the ones in the links above), like you would also use on wooden items in your kitchen, such as a cutting board, to make sure you stay safe in the kitchen. There are actually lots of uses for mineral oil throughout your home. You can click the link to read several already submitted by readers, or to share one of your own. In addition, I'd love to hear from even more people with their tips for cleaning their sinks. You can share your tips for how to clean kitchen sinks here, or read other tips that have already been submitted, for both stainless steel and other types of sink surfaces.